Black Gator Foam Board (Gator board) on sale at buz-line.com 30-50% OFF!!! Rigid poly-styrene foam core laminated between two face veneers of resin impregnated wood fibre. These lightweight but yet durable panels are ideal for graphic dispalys, mounting and much more. The hard, smooth surface resists dents, punctures and moisture. Shipped locally via our trucks. Oversized item. Standard shipping fees do not apply outside the Chicago Land area. Prior to shipping customer will be contacted with total cost for freight. 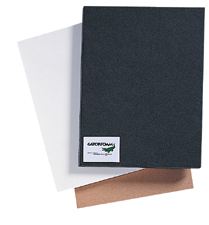 Gator Board or Gator Foam Board has a rigid poly-styrene foam core laminated between two face veneers of resin impregnated wood fiber. These lightweight but yet durable Gatorboard panels are ideal for graphic displays, mounting and much more. The hard, smooth surface resists dents, punctures and moisture. Custom cut sizes available upon request. * SIZE 48 x 96 SHEETS ARE OVERSIZED AND ARE SHIPPED BY FREIGHT. STANDARD UPS FEES DO NOT APPLY. IF YOU WOULD LIKE A QUOTE, PLEASE CONTACT US AT [email protected]OM. OTHERWISE, FREIGHT FEE WILL BE ADDED ON AFTER CHECKOUT. *48 X 96 INDIVIDUAL SHEET PRICES ARE LISTED AT THE BOTTOM OF THE PAGE.